In an effort to be healthy I decided to buy some bok choy. A friend of mine had made me some Kale by poaching it and serving it with lemon juice and salt so I figured I could make the bok choy the same way. 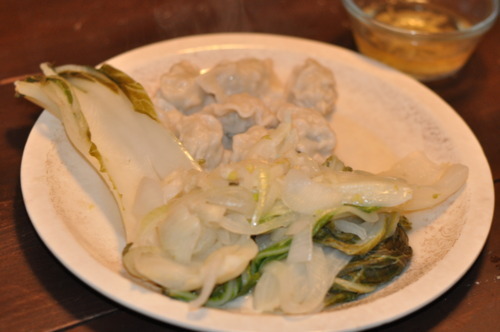 Since bok choy is asian I made some frozen dumpling as well that I found at Loblaws (read: expensive-ish Canadian grocery store). An Asian friend of mine had a dumpling party a few months ago where we made dumplings from scratch! She’s adventuring in Columbia now but they were so amazing I hoped I could recreate them in even half their glory by using frozen dumplings. I was wrong. I bit into the first dumpling and it was dry and tasteless (turned out the 8minutes boiling time they advised on the package was too little). 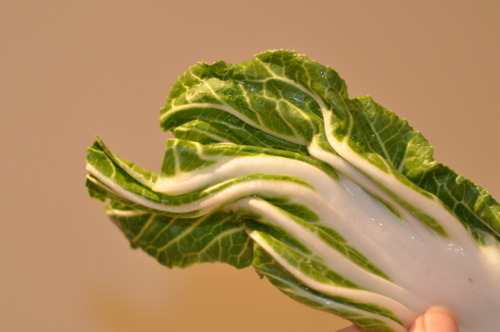 The bok choy was overwhelmingly lemony (I guess the juice of a whole lemon was too much?). Even the dipping sauce I made was almost unedible due to overpowering vinegar taste (I should’ve added brown sugar and peeled the ginger before grating it apparently). I begrudgingly ate my Asian Attack (I hate wasting food) but I couldn’t even eat the leftovers. Next time I will have to buckle down and make some dumplings from scratch! Anyone found a decent frozen pork dumpling? And/or any advice on what to do with the leftover bok choy (it keeps surprisingly well! )?